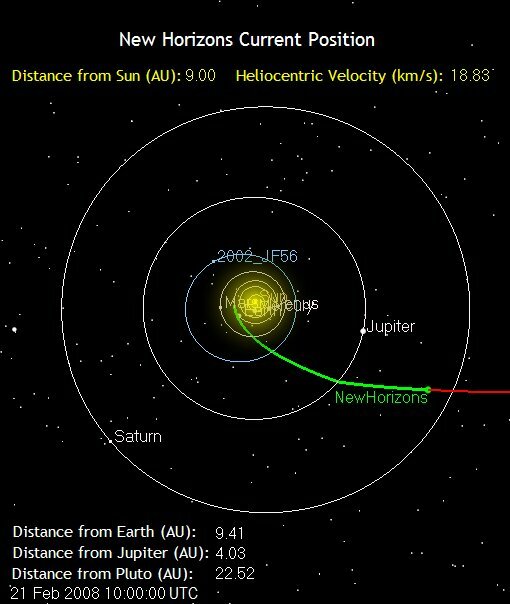 New Horizons passed a planetary milepost today at 5 a.m. EST when it reached a distance of 9 astronomical units (au) from the Sun – about 836.6 million miles, or nine times the distance from the Earth to the Sun. “The spacecraft destined for the ninth planet is now just beyond 9 AU and continuing outbound for the solar system’s frontier at more than 60,000 kilometers per hour!” says New Horizons Principal Investigator Alan Stern, of NASA Headquarters. New Horizons has covered nearly 970.5 million miles (1.56 billion kilometers) since its launch from Cape Canaveral Air Force Station, Fla., on January 19, 2006. Speeding toward Pluto at about 42,000 miles (67,500 kilometers) per hour, New Horizons will zip past the orbit of Saturn – where the Cassini spacecraft now operates – on June 8. 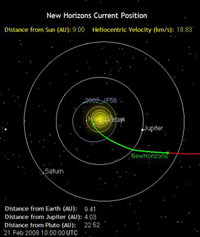 That crossing will make New Horizons the farthest spacecraft on its way to or at its primary target. New Horizons itself won’t have long to enjoy this latest accomplishment, though, as mission operators will put the spacecraft into regularly scheduled hibernation this afternoon at 3:50 p.m. EST.